Hey Dolls, happy mid-work week Wednesday! Today we are bringing you a quick post about easy retro hair styles. I am not sure about any of you, but there are some days where I really don’t want to spend the time laboring over perfecting my look. Wednesdays happen to be a day that always does that for me. So what we thought we would do is share two of our favorite YouTube videos that help us get the looks we love FAST! For the second video, I personally stop at the pony tail part, sometimes you only have time to get those front sections done! I love Youtube and all that is has in terms of the tutorials. It is a great resource for those fo you who may be new to vintage and don’t know where or how to start! What are some of your favorite videos or quick tips? We’d love to hear from you, we always need ways to make like just a little easier on those busy days! A wonderful guide to Kat Von D make up, it made us want to rush out and buy some ourselves! There is no secret in the fact that I’ve been a HUGE Kat Von D fan over the years, her beauty and talent is truly one of a kind. When Kat released her first book, I traveled to Toronto and waited in line for over three hours just to have the chance to meet her and get my book autographed. The Sephora staff all gush on how down-to-earth she is and truly appreciates her fans which was very evident when I met her as well. Needless to say, when her makeup line was released I had to try it…not knowing I would fall in love all over again. The quality is hands down one of the best when it comes to the luscious, highly pigmented and long lasting products. Now it’s time to share the fabulous products in my growing Kat Von D collection. During October, when we were coming up with our DIY Costume ideas, we thought about some of our favorite leading ladies of the 1950’s. These ladies are icons for their fashion choices as well as their acting abilities. While we were thinking of Audrey Hepburn, Jackie O, and Marilyn Monroe, one of my friends had me over to her house for dinner and a movie. During the course of the evening we ended up watching I Love Lucy. I have never really watched a lot of the show before, but with each passing episode there were several things I noticed. Lucille Ball was portraying a housewife to a moderately successful Cuban singer, she was in a leading comedic role, and during each end credit it stated that she was part owner of Desilu Productions. What struck me is this, Lucille Ball is always noted for her comedic skills, but underneath her well timed slap-stick, she really was a woman to admire. While Lucille Ball may have played the housewife on TV, she was so much more than that. She was a trail blazing woman, breaking ground for female comedians. What she did on I Love Lucy was innovative for the time. The show ran for 180 episodes. During each show she was always well dressed, known for mostly wearing swing style dresses. She often times wore dresses that had two toned collars and had a string of pearls. She was the embodiment of a 1950’s housewife in all the best ways possible. Some of the most common costumes that are sold stating they are “Lucille Ball” outfits have some sort of polka dot print, like the picture below. What we loved about Lucy was her pioneer spirit. She knew what she wanted and she made it happen. When the creators of the I Love Lucy show first approached Lucille Ball, they wanted another actor to play her husband. Lucy stated it would have to be Desi Arnaz or no one! She obviously got what she wanted. Not only that, but Lucille Ball got married much later in life (later than most women of her time) at the age of 40! She had spent most of her youth acting, modeling, and doing radio. After she was married at 40, she had two kids, another feat not often heard of for a woman of her age. When it comes to being the first woman to run a television studio, there is nothing but admiration for Lucille Ball. Oftentimes when people look back on history, especially in terms of women’s roles, they only want to look at the negative, but we here don’t think like that. As part of our motto to start a vintage revolution, we want to look at the positive impact that the past has played on the present, and Lucille Ball is definitely a part of that movement! She was a feminist before we needed to start burning our bras. If she saw something, she went after it, and we love her for it! Just like with Bettie Page, Katharine Hepburn, Audrey Hepburn, Elizabeth Taylor, all of these great women paved the way for something more, and when we fail to see that, we fail to admit to an important part of women’s history. 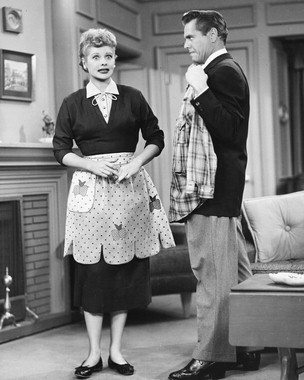 Just because a women may play the housewife on TV, doesn’t mean that her only role was to be domestic, Lucille Ball proves it. We want to hear about what women from the past have made an impact on you and why! Share some of your favorite stars and what they represent to your love of vintage. How did they start a vintage revolution for you?